Our old Chevy Station Wagon (just like the one above only dark green) didn’t have AC, was cramped and crowded, out of style, and did I mention green? We were all beyond excited when Dad finally decided it was time to trade her in! When he pulled into the driveway with a sleek new light blue, shiny, air-conditioned beauty we were overjoyed. We quickly piled in for a ride and our trip went right past the car dealership where we saw our old, green used-up, dilapidated, banged up, has-been of a vehicle in the back lot. We asked Dad to turn around so we could see her one more time. From our new perspective, sitting in the air-conditioned comfort of our new car, our old car looked abandoned, lonely, and rejected. Our hearts were heavy for our discarded green friend sitting all alone in the back of the lot. As I recall, we actually cried as we drove home. We loved that car; it had proved faithful to our family and now we had tossed her aside. Believe it or not, the next day dad went back to the dealership and switched cars! When we saw the green beast back at our house we jumped for joy… until we remembered all the reasons we needed to trade her in. We were back in blue in no time. 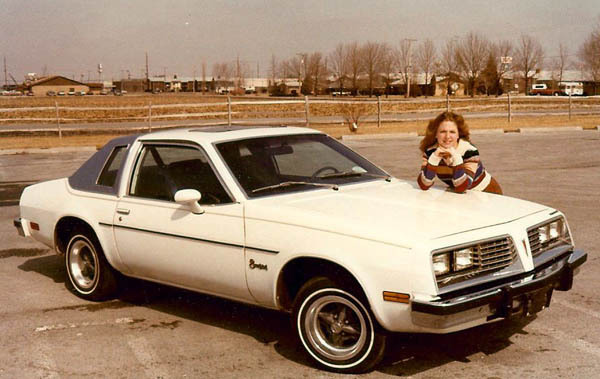 After Brian and I were married, our first big purchase together was our 1980 Sunbird. We loved that car… until we had children. Putting a car seat in the back of that little car was like trying to manipulate a hippo into a bikini. By the time the car seat was secured and ready for a child, Brian and I were bruised, frustrated, exhausted and totally depleted of patience. Let the road trip begin? And then we had another baby – and another car seat! Bring on the mini-van! It’s clear that when we outgrow our vehicles, or they begin to fail, it only makes sense to trade them in. They are, after all, nothing more than big expensive hunks of shiny metal that get us from point A to point B and we need wheels that we can rely on. The greatest trip from point A to point B that we will ever make is the trip from this life into eternity and we need a reliable vehicle to get us there, one that we can’t outgrow, and one that won’t fail us. You may think of religion like cars: perhaps you’ve tried one religion for a while, and when you outgrew it, or it was no longer comfortable, or it started to fail or became cumbersome you traded it in for a different model – another form of religion. Maybe you aren’t so sure there’s only one way – one vehicle – of salvation. If you aren’t sure about Christianity, may I challenge you to do at least as much research as you would if you were car shopping: investigate who Jesus is, what/who does he claim to be, and how is he different than any other historical figure. You probably wouldn’t buy a car based on other people’s opinions, you’d want to examine it, touch it, drive it, and go to a dealership to actually see the car in person. It is the same with Jesus: you will find the answers to your questions, and see him in person in the Bible. Once you have the facts you must weigh them and decide if they are true. No one can decide or believe for you, this is an individual choice. Should you decide the facts are true, there is one more step, you must commit to trust Jesus. Trusting Jesus is more than simply believing Jesus, you must choose to believe in Jesus. To believe in Jesus requires both faith and repentance. Faith is trusting Christ to forgive your sins and save you. Repentance is turning away from sin and turning toward Jesus. Faith and repentance go hand in hand. Jesus is the only way, the only vehicle, of salvation. The great thing about coming to faith in Jesus Christ is that you will never regret the decision. You will never outgrow Jesus. He will never be outdated, old-fashioned, cramped, crowded, or uncomfortable; and his mercies are new every morning. He is faithful and trustworthy. He will never fail you. He will bring you to your destination. Is Jesus your vehicle for salvation? We have choices thru our faith in Jesus. And yes we need to make them. And life is easy which is also a choice.